Yesterday afternoon, a phone call came in from Eric of La Mesa Flooring. My order of Armstrong vinyl has arrived and is available for me to pick up! Perfect timing! The installation of my living quarters raised floor is almost complete. All that remains is securing the 3/4" plywood top plate to the raised floor's frame. I will do that this morning! Raised floor before the 3/4" plywood top plate. I have declared today to be a Rainy Day Session. The rain began during the nite and has continued all day long. During this Rainy Day Session, a lot of things got loaded into Box Van. So many things in fact that no work may be done until at least one of these things is off-loaded! That thing is the 12-foot long roll of Armstrong Vinyl from La Mesa Flooring. This vinyl roll extends all the way from my living quarters to Box Van's big roll-up door! The Three Leveling Jacks that I told you about several days ago also arrived. These jacks were received for me at our Postal Annex mailbox. There were more packages at the Postal Annex waiting to be picked up today than I had ever seen before! And the Postal Annex owner did not see appear too happy about that! He was short-temped with me. He demanded that my packages be removed quickly. I explained that I was unable to handle the big carton. Then, he calmed down a bit and moved it out of the store for me. I have decided to Reconsider Rainy Day Session. I really am anxious to lock-down the top plate for the raised floor. It will be a bit tricky to do that lock-down with the vinyl lying right across the living quarters. But I believe that I will manage. 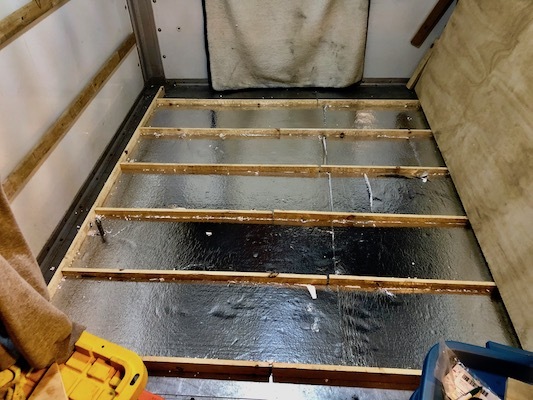 I'm looking at the picture of the raised floor but the insulation looks like it only fills 1/2 the height? That's because George decided to stand the sleepers on edge rather than the more conventional method of laying them flat. He's going to have to be very precise when nailing the plywood down because he only has about a nailing surface for each sheet where they join together of 1/2 of about 5/8" rather than 1/2 of about 2 5/8". It can be done with great care and accuracy. He is using tape and no nails. Rita is correct. I am using 3M VHB tape for securing the sleepers to the aluminum deck below and the sub-floor above. My sleepers are 3/4 x 3 board, and this size would never be installed flat. I am not using any nails. I am using deck screws when necessary. The R-Tech insulation is 1" thick. The frame of the raised floor is 2-1/2" high. So, the space above the 1" insulation is 1-1/2" high. Phil, you have a good eye to get that from the picture! I think I would lay pex piping and cable in the floor for future use before I installed the plywood. Maybe you are correct. But the sub-floor is installed now.